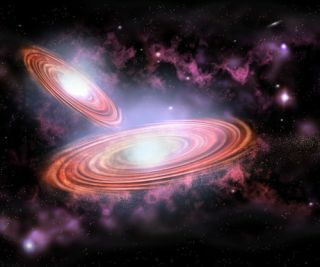 Researchersfinally have strong evidence for the existence of a binary black hole system, along-theorized result of galactic mergers that features two black holesorbiting around each other at the center of large galaxy. The blackholes are expectedto merge in what astronomers figure would be one of the most energeticevents in the universe. The newevidence comes from a study of the light signatures of 17,500 quasars ?extremely bright features at the center of galaxies, thought to be powered by black holes ? taken bythe Sloan Digital Sky Survey and detailed in the March 5 issue of the journal Nature. It has longbeen accepted that most large galaxies harbor black holes at their centers.Astronomers also think that mergers between galaxies are common ? our own MilkyWay is ona collision course with our nearest neighbor, the Andromeda galaxy (thoughthis merger won't happen for several billion years). Bycombining these tenets of astrophysics, it's a logical leap to the eventualmerger of each galaxy's black hole. "Theyshould merge, and we expect them to," said study team member Tod Lauer ofthe National Optical Astronomy Observatory (NOAO) in Tucson, Ariz.
Lauerlikened galaxies to fluffy masses and the black holes at their centers to rocks? eventually through interactions with the fluff (the stars of the galaxy), theblack holes lose orbital energy and fall to the center of the newly-mergedgalaxy. But oncethey've migrated to the center, interactions with stars are rare, "and theblack holes orbit each other in a small tightly bound orbit, unable to looseenough momentum so that they could actually merge," Lauer explained. It was atthis stage that Lauer and study leader Todd Boroson, also of the NOAO, thinkthey detected the signature of two separate black holes in the spectrum of thequasar known as SDSS J153636.22+044127.0. The blackholes appear to be separated by a mere 0.1 parsec, 13 times shorter than the distancebetween our sun and its nearest neighbor, Alpha Centauri. The researchersroughly estimated the masses of the pair, coming up with 10 million solarmasses for the smaller black hole and a little less than 1 billion solar massesfor its larger partner. They also estimated that the black holes orbit eachother about every 100 years. Previousstudies, including one of thegalaxy NGC 6240, have shown potential evidence of black holes heading for amerger, "but the case presented by Boroson and Lauer is special becausethe pairing is tighter and the evidence much stronger," wrote astronomerJon Miller of the University of Michigan in an accompanying Nature analysis.Miller was not involved in the new study. "Wethink we have the best one so far," Lauer told SPACE.com. While thisevidence shows possible binary black holes squeezed closer together than anyyet found, Boroson and Lauer still need solid proof that this is a binarysystem. "Theissue is that this is a good candidate for a binary, but we haven't proved itbeyond doubt," Lauer said. Once theblack holes have reached the gravitational center of the merged galaxy and comeas close as they can through interactions with the surrounding stars, they needan extra push to fully merge. If gas later collects at the center of thegalaxy, it could absorb some of the remaining orbital momentum of the blackholes and provide that extra oomph to push them into a merger. Black holesthat have reached the point of merging are expected to give off gravitationalwaves, or ripples in the fabric of space-time predicted by Einstein'sGeneral Relativity. Scientists hope that the Laser Interferometer Space Array(LISA), currently in development and designed to detect these waves, will beable to catch black holes actually in the act of merging. In themeantime, Lauer and Boroson will continue observing their quasar to see ifchanges in the spectrum over time (as the black holes orbit one another)further support the existence of a binary black hole and rule out thepossibility that they are two separate objects super-imposed. Lauer thinks thisis unlikely because "the spectrum is difficult to explain with twodifferent objects." The paucityof signatures of black hole mergers and binary black holes so far could meanthat these are much rarer events than scientists had thought. "Welooked through 17,000 of these and found this one beast," Lauer said. "They should be very common." But it'spossible that LISAcould provide a wealth of evidence once it gets off the ground. It's alsopossible that binaries are only detectable when actively accreting gas and thatmost reside in so-called normal galaxies that are not in an actively accretingquasar phase, Miller noted in his editorial.